From here, Howe and Greenberg argue that the anti-heroic element can be found in the rejection of “historical aggrandizement.” Tevye, for them, is the “embodiment of the anti-heroic Jewish hero whose sheer power of survival and comment makes the gesture of traditional heroism seem rather absurd”(40). Not only his language but also his “ironic shrug” is symbolic of this ahistorical, anti-heroism. 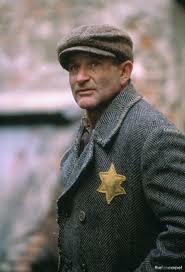 Howe and Greenberg point out, however, how Aleichem had more patience with this anti-heroism while I.L. 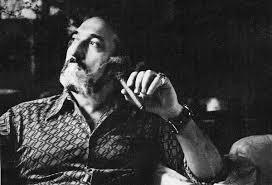 Peretz had less. Perhaps because Peretz was more fed up with anti-heroism and wanted to enter history, they put this in quotation marks, “modern.” This suggests that both Greenberg and Howe have sympathies with Aleichem’s project which, in their view, challenges the modern view of power and heroism. The character that Zionist and more “modern” Yiddish writers want to leave behind is the little man, the “kleine mentschele”(40). It is “he, the long-suffering, persistent, loving ironic” character whom “the Yiddish writers celebrate.” He “lives in the world” while the heroes of Western literature conquer it. Out of the humble, little man come “a number of significant variations and offshoots.” One of these is the schlemiel, par excellence: “the wise or sainted fool who has often given up the householder’s struggle for dignity (think of Tevye) and thereby acquired the wry perspective of the man on the outside”(40). He acquires, with the piling up of his foolishness, a halo of comic sadness, and..in the end, his foolishness innocence triumphs over the wisdom of the world”(41). Although Howe and Greenberg note that “Gimpel is the literary grandson of Peretz’s Bontsha Schweig,” they point out how he is a different kind of schlemiel since Singer, as opposed to Peretz, was more interested in preserving the character. Howe discusses two other examples of the holy fool, schlemiel in this section, but he ends with a meditation on the child as the ultimate heroic anti-hero. For whatever the deficiencies of Yiddish culture, the power of love remains; for the child, the poor, the weak, the insulted and injured everywhere. It is the power at the heart of the Yiddish tradition. (42). The word “everywhere” suggests that Howe and Greenberg find the love for the child, the poor, and the injured, which is particular to Yiddish culture, to be its greatest “power.” Howe and Greenberg suggest that the schlemiel – and the Yiddish culture it emerges out of – can present us with a universal that we can, today, learn from…even though the world that gave birth to it is gone. It presents a different, “sweeter” way to look at the world which, though not heroic in the western sense, is compassionate and can give hope. But, as I noted, what happens when that world is gone? How does this universal live on if there is no world to nurture it? And doesn’t this relation to power emerge, as Hannah Arendt once said, out of worldlessness (not the world)? Instead of making “impossible the power hunger, the pretensions to aristocracy, the whole mirage of false values that have blighted Western intellectual life,” our world does the opposite. Unless, that is, we were to sink into a poverty and powerlessness much like the world of the Yiddish writers and, out of this, to find compassion and love rather than cynicism. It seems as if Howe envisions a world and an attitude that doesn’t emulate “crisis” and harsh realism so much as a “sweet” kind of realism that is based on love. And his examples of such a world are to be found in the aesthetics it produces. They are his guide and are the remnant of a feeling that could speak truth to power. Lest we not forget, Howe and Greenberg wrote these words in the 1950s. How would they fare today? Are we, in our frustration with power, heroism, and Empire (as Hardt and Negri would say), looking for the schlemiel? Are we looking for the “writers of sweetness” who can give us characters that emerge out of poverty and remain anti-heroes from start to finish? Are we, today, looking for characters that evince compassion or are we looking for, as Howe would say, history, greatness, and heroism? And if Howe is with Aleichem rather than Peretz, would that suggest that his greatest enemy is…history? Are we looking for the world or for worldlessness? After all, Howe suggests that the schlemiel is not interested in heroism or making history so much as being in solidarity with those who don’t make history but are wounded by it: the poor, the injured, etc. Or is it the case that the schlemiel is not so much a free choice so much as a choice that is made as a result of being….without history and…worldless? The schlemiel is often thought of as the Jewish fool who, in the traditional joke, is paired up with a nudnik and a schlimazel. The schlemiel, as the traditional joke goes, is asked to get a bowl of soup by the schlimazel. When the schlemiel gets right near the table, and it seems as if all will go well, he spills the soup of the schlimazel’s lap. The schlimazel, who receives the bad luck, screams out. And the nudnick asks what kind of soup it is. In this scenario, the schlemiel is portrayed as a perpetual bungler who disseminates bad luck wherever he goes. (In fact, all three figures congregate around bad luck.) As the explanation goes: Jews, accustomed to bad luck throughout their history, took to this character so as to laugh at their misfortune. But, to be sure, there is obviously more to the story. The schlemiel is not the ordinary fool and shouldn’t simply be thought of as a bungler. The schlemiel is, to be sure, related to the Jewish saint. His failure has deeper roots. Wisse was referring to the Yiddish tradition of schlemiel literature. And her explanation of the schlemiel is framed in terms of the translation of Rabbi Nachman’s simpleton into Yiddish literature vis-à-vis the concept of faith and acting “as if” the good will triumph. What I would like to suggest is that we approach the schlemiel’s relationship to religion and literature differently. 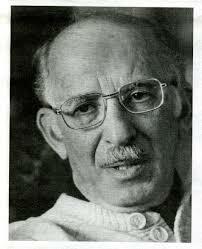 Instead of looking into Yiddish literature, I would like to take up the schlemiel in post-Holocaust Jewish-American literature (namely, by way of Bernard Malamud, one of it’s greatest representatives); and instead of looking at the schlemiel by way of Wisse’s framework for faith and its translation into the secular, I would like to use a different model based on Edith Wyschogrod’s reading of Levinas in terms of addressing the Saint and hagiography. The latter, as I hope to show, is a model which helps us to understand how faith is not an idea but something that is transmitted, as Wyschogrod would say, by way of “samples of ethical behavior”(277). Unlike Wyschogrod, however, I am not taking actual saints as my example so much as schlemiels who, to be sure, are really saints in disguise. The main character of Bernard Malamud’s novel, The Assistant, a Jewish store owner in the post-War era named Morris Bober is a case in point. Since, today, our hagiography is fiction and our saints are the “little men” and everyday people. Before we begin our reading of Bernard Malamud’s The Assistant, I’d like to briefly go over Edith Wyschogrod’s reading of Emmanuel Levinas, Saints, and Hagiography. To begin with, Wyschogrod, in an essay entitled “Exemplary Individuals: Toward a Phenomenological Ethics,” argues that her starting point for a reading of hagiography and saints must start off with what she calls “carnal generality.” She draws on this notion from the work of Merleau-Ponty and Levinas (264). For Ponty, “generality is inscribed in the incarnate subject, an ensemble of self-transcending acts and lingual capacities. By contrast, Levinas focuses on the alterity of other persons and its impact on the self, an alterity that cannot be brought into conceptual focus by language.” Although these definitions differ, “both agree that the psycho-physiological primordium that is the incarnate subject expresses a generality of which universals and essences are derivative types”(264). Wyschogrod argues that these generalities are “context-specific” (she calls these contexts “carnal generality”). In the spirit of phenomenology, Wyschogrod argues that Ponty, in his “analysis of social existence,” looks, through “successive exfoliations” of the context, to get at the “essence” of the phenomena. However, Wyschogrod notes that Ponty stays away from the word “universal” and suggests that we use the word “carnal generalities” to avoid the connotations suggested by words like “essence.” To be sure, Wyschogrod tells us that he uses the term “carnal generalties” in reference to “dialogue” and language. Drawing on this, she argues that “this generality is constituted by the power of the self to inhabit the body of the other”(265). In other words, language is the medium that brings a “carnal generality” between self and other together: “together the other and I form an ensemble of significations, a single flesh that is traversed and expresses meaning”(265). Wyschogrod notes the difference, however, between Ponty and Levinas on this issue of language. While, for Ponty, there is a coming together of the self and other in moments of communication, for Levinas, “the breach between the self and other is unsurpassable”(266). This difference, argues Wyschogrod, is what “”opens discourse” and makes “ethical relation possible”(266). Regardless, for Levinas and Ponty, the “carnal generalities” remain. The question, however, is what they communicate and what we can learn from them. For Wyschogrod, “carnal generality” conveys what she calls “exemplification” and this is best seen in hagiography. To introduce this new idea, Wyschogrod, instead of writing about saints and their hagiography, talks about a case of “idiot savant twins” convey by the neuropsychologist Oliver Sacks. In his account of the case, Sacks recalls how the two would engage in “a singular and purely numerical conversation,” a “mathematical game in which they exceeded the competence of the most sophisticated mathematicians”(269). After watching them, Sacks concluded that “the twins did not form abstract notions of numbers but experienced them in some sensuous and immediate way”(269). As Wyschogrod explains, Sacks discovered that they learned and communicated not by way of mathematical ideas but…spatially. Saints, argues Wyschogrod, are not much different: “they are idiot savants of the ethical, although, in contrast to the twins, they often possess considerable psychological acuity, as well as remarkable powers of political and social organization”(269). Wyschogrod argues that the entire life of the saint is devoted to the “alleviation of sorrow (psychological suffering) and pain (physical suffering) that afflict other persons without distinction of rank or group…or that afflict sentient beings, whatever the cost in pain or sorrow to him or herself”(270). With this definition in mind, Wyschogrod argues that not all saints are mystics in the sense that they do not all experience a from of unity with the Godhead but many, the most ethical, remain painfully incarnated (270). Her project is to preserve, for “modern and postmodern critics,: a “concept of saintliness” by “uncovering singularities,” which she associates with the “landscapes of the saintly imagination”(270). To illustrate how this relates to hagiography, Wyschogrod cites a few passages from St. Teresa of Avila and St. Catherine of Siena. But the last two examples she cites come from the Baal Shen Tov and Buddhism. What she notes, in this hagiography, is how the “trace of transcendence” can be seen in them. To be sure, she notes that the bodily presence in them is an ethical figure. Unlike Wyschogrod, who took saints as her samples, I would like to take the schlemiels of modern fiction as our samples. There is a “trace of transcendence” in them. 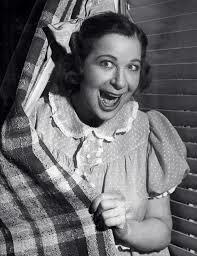 Perhaps the reason Wyschogrod overlooked them is because she didn’t associate the comical with the ethical. And this, I believe, needs to be addressed. To be sure, as I have noted, the schlemiel, as Wisse sees it, is ultimately a religious figure. It can provide us with a sample that is closer to us since the world we inhabit is much more ironic than the world that the saints occupied. To be sure, I think that the saint’s hagiography survives by way of schlemiel fiction. And it speaks to us in an intimate manner after the Holocaust. When I watch comedy, I’m always curious as to what kind of life this or that comedian lived while growing up. Like many theorists of comedy, I do think there is some plausibility to the claim that comedy, in some way, is born out of and addresses some kind of trauma or loss. Ruth Wisse, in her book The Schlemiel as Modern Hero, claims that schlemiel humor is a response to failure and weakness. After all, Jews were often excluded from history and often related to the countries they lived in from a position of weakness. Given this situation, Wisse argues that the schlemiel and it’s brand of Jewish comedy are a “theoretical reversal” of history and creates what she calls an “ironic victory.” However, the victory is ironic because the memory of trauma, loss, and failure persist. Jews are acutely aware of this. But, at the very least, comedy mitigates the power they have over Jewish life and gives the comedian some kind of freedom. The victory is, at best, minimal. But, at the very least, such humor provides, as Irving Howe might say, a margin of hope. The comedian, to be sure, gives the audience not something to laugh at so much as a way to address suffering and loss that is not a negation of it so much as a way of facing it with some kind of intelligence which, in turn, bears on our freedom. 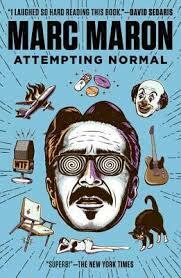 When I first started reading Marc Maron’s book Attempting Normal, I was astonished to learn that he grew up in a house with a psychotic father. Like the comedian Marc Maron, I also grew up in a household with a brilliant psychotic father. And like him, I also felt like, because of my life growing up, I was also “attempting normal.” Reading this book for the first time, I was so excited to learn how he, through humor, addressed the suffering he went through by virtue of being the child of a psychotic. Like Maron, I became very interested in humor. And when I started reading his book, I knew he would approach it in ways that would make perfect sense to me. Through humor he found a way into a way of life he had, since youth, never known. And although he would never “be” normal, at the very least he could “attempt” it. This very thought is one I know intimately. To be sure, I feel that I “attempt” it in nearly everything I do. And there is something comical and something very sad about that fact. To be sure, as a result of my experience, I have spent most of my life trying to put the pieces together. Along the way, it occurred to me that, as a result of my odd and brilliant father, and the psychotic experiences I had been a part of, I had, like Maron, become a schlemiel. In one of my first blog entries I called myself a schlemiel and a son of a schlemiel. It stuck me that this is appropriate because, from what little experience I have of psychotic individuals (I was raised by one) I can say that they are, by and large, schlemiels. They dream big and often reinterpret reality to fit into the their psychotic narrative (in which they are the winners and they control the show). However, unlike the schlemiel, the psychotic is far from a nebbish. He or she goes out of her way to make reality conform to his or her vision. The psychotic is not simply living in an imaginary world; they actually change reality. And this often gets them in trouble. To be sure, my father was arrested several times and was thrown into many mental institutions because of his psychotic actions (and by psychotic I don’t mean violent but…unusual). In the film Shlemiel (2011), by Chad Derrick, I recount some of these experiences. And, as a filmmaker, Derrick was interested in why I turned to this comic character and how I, like Maron, attempted normal. Maron’s retelling of his father’s psychosis has a comic element that touches me and inspires me to write my own account. For this reason, I’d like to briefly discuss some of Maron’s stories and bring together what makes them not only a lesson for me but for anyone who wants to understand who humor relates to madness and suffering. Being the children of psychotic parents, and not being psychotic ourselves, we can laugh at the stories and gain some kind of understanding of our parents and ourselves. His father, in his eyes, was a man-child, a schlemiel. And he sees him as simply refusing self-awareness. This is a fascinating claim because I also thought of myself as more rational than my father and saw him opting out as things went down the tubes. But although the son of the schlemiel may be the rational one, in the end, he is still deeply affected by the erratic nature of his father’s actions. Nonetheless, by recounting it, in this way, Maron gives the background for the comical events his father would spur on him – namely, in moments that would require the greatest seriousness. In these moments, the inappropriate things his father does are comical; but seen against the background of his life and upbringing, we see the humor as bordering on sadness.